• NEED TO CONTACT ANOTHER REMCO MEMBER? The REMCO Christmas luncheon is free to REMCO members. This year's Grand prize is an Apple I pad donated by MERCO CREDIT UNION. The winner of the grand door prize will be determined by members only playing one game of bingo. Will also have a Christmas tree money grab where you could win up to $100. Many other door prizes so make sure to bring cash to purchase your raffle tickets. Pork Lion, Au gratin potatoes, string beans, salad, rolls, and peach cobbler. MAKE SURE TO CALL IN YOUR RESERVATIONS SO WE KNOW HOW MUCH FOOD TO PREPARE. On December 31, 2017, the terms for three MCERA Retirement Board seats will end. These seats include one of the Board’s Miscellaneous members, a Retired member and a Retired Alternate member. MCERA board member terms are for three years, except for the County Treasurer’s seat. While the Miscellaneous Board seat is to be elected by active Miscellaneous members, the Retired and Retired Alternate seats are elected by MCERA retirees. Notices will soon be sent out in early October to MCERA retirees and Miscellaneous members by the Merced County Registrar of Voters. Ballots are to be distributed on November 1st with November 21st being the final date that ballots are to be submitted. The MCERA Board is comprised of nine members and two alternate members. 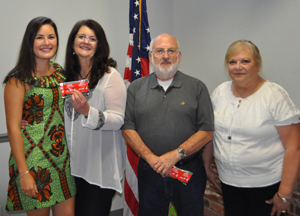 Members include the County Treasurer; four members appointed by the Board of Supervisors; two members elected by Miscellaneous members; one member elected by Safety members; and one member elected by retired members. Safety and retired members also elect an alternate. MCERA Board member responsibilities include determining investment strategy and managers; selecting outside actuaries; and reviewing and ruling on disability retirement applications and special cases. The Board’s management functions are governed by the applicable provisions of the California Government Code, and the by-laws and policies of MCERA. Board member requirements include attending at least two MCERA Board meetings a month and have a continuing education requirement." This election is very important to ALL MERCED COUNTY RETIREES!! Our current elected representative, Ron Kinchloe, will not be running for re-election (can you imagine that? - - he actually wants to be retired!?!). Ron has done an excellent job for several years. Ron's Alternate, R. "Scott" Johnston, has also done an excellent job representing Merced County Retirees and has attended meetings on a regular basis. Please be sure to vote and return your ballots to the Merced County Registrar of Voters as soon as you get them! Thanks for representing the retirees of your county. Retirement systems and benefits under threat. A backlash caused by two things. Steady attacks on government, government service and government employees. The positive message that much good work is done by everyday employees of government does not sell newspapers and it does not get politicians elected. It also does not fit the mantra of those who profit by weakening government oversight of their activities. Powerful forces benefit by demonizing government, and government servants. We need a counter revolution that pushes back. One that highlights the positive impact of social workers on our communities, of public work employees on our road infrastructure on all the things we take for granted. We need to send out a message that our security, our economic health, our overall wellbeing, is best protected when we have strong communities. Where we care about and take care of each other. Where we don’t ignore large segments of our population. Where we are not aphetic to the negative impacts of growing income inequality. It is positive collective action that makes our communities stronger. Many times the best way to take that positive community action is through our local governments, particularly our county governments where the tire meets the road. County’s have the broadest mandates. We are the closest to the ground and the actual delivery of services. Often times your steady daily service made a quiet but important impact on your community. The child whose life improved because of the money that was collected for child support, the disease that was controlled by the efforts of public health workers, the list is impressive. Your ability to contribute did not end when you retired. In fact, retired government employees are one of our community’s greatest assets. You know the system, you know your community in a way many do not. You know where to plug in to make a difference. We need you to keep making a difference. We need you to keep the flame alive until a better political climate evolves in this country. One example, foster care across this state is in a jam. More homes needed. Best signature gatherers for SOAR were retired county employees. List other examples of how they can help. Most important, engage the national debate about the role of government. Vote, get involved in political efforts. There is great public resentment against anyone who has a pension. We need to remind people that as late as the 1980’s sixty percent of American workers had a pension. What those without a pension need is a pension, not to ruin the secure retirement that others have worked for. And they need to be reminded that it is primarily government that will assure their retirement security. Currently, even Social Security and Medicare are under attack. This is an opportunity for finding common cause between public pension holders and those whose government retirement security is under attack. Let’s have public pension organizations lead the defense of Social Security and Medicare. Even in these challenging times, let’s not go quietly. Let’s show them how proud we are of what we have accomplished. How willing we are to continue to fight for it. How effective we are when we commit to a cause. Thank you for your past service, thank you for serving your fellow retirees today, thank you for what you will do for your community tomorrow. We received more mail returns on the last newsletter than ever before! The newsletters are mailed at the "bulk rate" with the USPO, but each mail return costs REMCO the (more expensive!) USPO "first class" rate. PLEASE REMEMBER to advise MCERA (the retirement office!) and REMCO of any change of residence or mailing address. If you receive the newsletter via email, please also send a notification of any change of address, or change of email address to me by email! This will assure you continue to receive your newsletters and other information. Failure to notify MCERA of an address change could also cause other important issues with your retirement benefits. If I receive an email returned as "undeliverable", I will simply delete the email address from my list - it is your responsibility to keep it up to date! I hope you are enjoying retirement and having a wonderful summer! One of REMCO's past scholarship recipients, Gabrielle Nord, recently shared about her time spent living in Malawi and serving as a volunteer research assistant for Project Peanut Butter (PPB); a non-profit organization committed to treating children with moderate to severe malnutrition throughout sub-saharan Africa. Moved by the fact that malnutrition takes the lives of more children than any other disease in the world today, Dr. Mark Manary founded PPB in 2004 and has committed his life to advancing the treatment of severe malnutrition. Through dedicated research, Dr. Manary and his team created a highly effective, locally produced, ready-to-use therapeutic food, known as RUTF or “Chiponde”. This peanut butter-like product consists of roasted peanuts (peanut paste), powdered milk, vegetable oil, sugar, and vitamins/minerals. RUTF has not only revolutionized the treatment of malnutrition worldwide, but has increased the recovery rates in children to 75-90%. The old standard treatment, a milk-based formula, required mothers to travel to crowded hospitals where their sick children were often exposed to a variety of diseases and only recovered 25-40% of the time. Since RUTF has been introduced and distributed, malnourished children are now recovering in 12 weeks’ time and in the comfort of their own homes. Volunteers, like Gabrielle, are responsible for traveling to surrounding villages with a team of Malawian nurses and drivers to screen children for malnutrition and enroll them in the 12-week long, RUTF treatment program. The team returns to clinics every two weeks to check the progress of enrolled children and screen any new ones who may have become malnourished in the time in between. PPB’s team in Malawi screens and treats over 2,000 children a month and during “hunger season", when rural families wait for their crops to be harvested from January to May, that number nearly doubles. If you are interested in learning more, volunteering, or donating to Project Peanut Butter to help them continue saving the lives of children, please visit their website at www.projectpeanutbutter.org or contact Gabrielle Nord at gnord4@gmail.com. Thank you for your time and consideration! MERCED COUNTY RETIREES CONFIDENTIAL INFORMATION COMPROMISED - READ WHAT YOU CAN DO. As many of our members are aware, a recent ballot initiative to eliminate Defined Benefit pension plans has been ordered removed from the ballot in the November election. CRCEA (California Retired County Employees Association) was the only state-wide retiree group to participate with San Diego, San Joaquin, Ventura County Retirement Associations and the Retiree Employees of San Diego County (RESDC) in the court case by filing an Amicus Brief (friend of the court) which argued against allowing the initiative a place on the ballot. The Judge in the case ultimately ruled that placing the initiative on the ballot was “a “waste of public resources.” He also stated that putting this measure before voters would have been an enormous waste of taxpayer money because it only would have been ruled unlawful. CRCEA’s immediate move to “jump into the action” demonstrates that the voices and votes of 160,000 retirees is a strong force in the protection of public employee benefits, a force which CRCEA will continue to assert whenever the need arises. NEED TO CONTACT ANOTHER REMCO MEMBER? If you would like to contact a former co-worker contact Michael Sofranek by email at REMCOMERCED@YAHOO.COM. That person will be contacted with your name and information to contact you. REMCO members who are recruiting new members have a complete list of all county retirees. Merced County Employees Retirement Association Every 2nd Thursday of the month M.C.E.R.A. has a general meeting starting at 8:15 a.m. and is open to all REMCO members. Every 4th Wednesday of the month M.C.E.R.A. has an investment meeting starting at 8:1 5 a.m. and is open to all REMCO members. Meetings are held at the M.C.E.R.A. office at 3199 M Street in Merced. Phone 209-725-3636. REMCO members can list an item for sale or a service they provide on the REMCO website for free. Items for sale will be listed for thirty days and then removed. If your item sells sooner please send an e-mail to the address below so the item can be removed. You can e-mail a description of what you want posted on the REMCO website to REMCOMERCED@YAHOO.COM. Your posting will be placed on the website just as you sent it so be sure your e-mail is exactly how you want it to read, including your contact information. We have members of REMCO that would like to attend our luncheons but lack transportation. I have started a program that will hopefully get more REMCO members to our luncheons by creating a “car pool” list of members needing rides and / or those willing to provide rides to one, several, or all of the luncheons. Please contact me, Michael Sofranek at 209-374-3465, if you are in need of a ride or willing to provide a ride to our luncheons. I will at tempt to find someone in your area or match you with someone on the car pool list. Get involved! Have some fun! 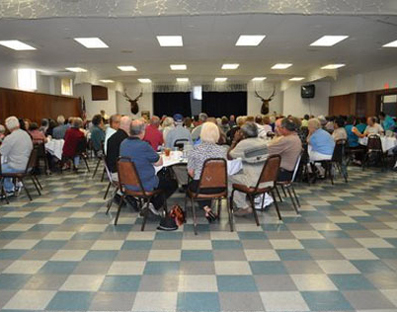 REMCO quarterly luncheons / meetings are held on the second Tuesday in March, June, September and December at the Merced Elks Club, 19th & M Street, Merced at 11:30 A.M.
You can make your quarterly luncheon reservations by e-mailing REMCOMERCED@YAHOO.COM. Be sure to include the names of all those who will be attending the luncheon.